Before we get too deep into this, I need to give you a patience alert on this recipe: Even if you are deeply inspired and you start cutting lemons before you even finish reading this post (watch out for that laptop keyboard! that juice flies! ), even if you do that, it will take a full three weeks before you can actually eat them. That’s right, 3 weeks. I was going to wait to the full 3 weeks before I even shared this with you. I had all of these grand plans about a post that not only showed you how to make preserved lemons, but gave you 3 recipes that involve them. I was going to wait because before I shared those recipes with you, I had to actually have the preserved lemons. 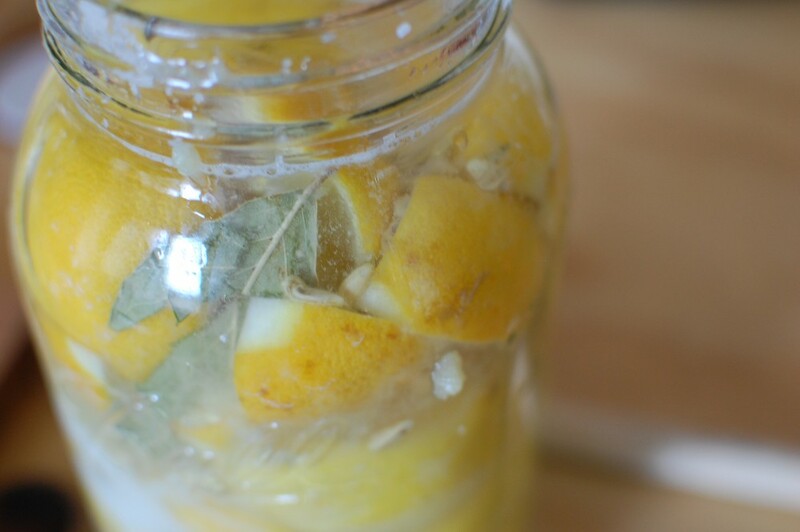 It all seemed like a good idea, to get it all together and be your one-stop-shop post for preserved lemons and what to do with them. But then I thought about you sitting in your kitchen 3 weeks from now, reading that post about the 3 recipes with NO HOPE OF PRESERVED LEMONS for weeks from then. And so I thought perhaps, instead, that we would wait for our lemons together. Then we could enjoy them together, too. I remember the moment so well because a taste like that will make a memory cling. It was everything about a good fermented pickle, and everything about a lemon, and everything about some new creation when the two combined. I wanted to eat the whole jar. It was that kind of magic. He gave me the recipe, and I never made them. At that point I was only interested in food enough to know that I wanted to create these wonderful things that other people fed me, but I was weak on the follow-through. And a year later, there I was in Janet’s kitchen, and again with the fork, and again with the “eat this,” and again I thought that this might just be the most wonderful and perfectly balanced taste I have ever experienced. Again, I didn’t make them. Fast forward to right now, or rather, about a month ago. I was in New York for meetings with a few magazines who had expressed interest in featuring the book in their Spring issues, and I was at Luke and India‘s apartment in Brooklyn for dinner. It was a night of torrential cold rain, and over the course of my train ride down to the city and my subway ride from Grand Central to Brooklyn, I had come to terms with the fact that I had a delirium inducing, thought impeding head cold. My only hope was to insist to my own body that I didn’t have a cold, that I would certainly not be walking around the next day meeting with magazine editors with a red nose and an inability to pronounce the letter “n”. But when I walked into Luke and India’s, the next day was looking pretty grim. They swooped around me with love and tea and fizzy Vitamin C drinks, and the home they have carved out in that Brooklyn apartment building breathed some life back into me. All of the angry, wet New Yorkers with their poking umbrellas drifted away, and I was cozy on the couch sharing a pot of tea with their little girl, Odette. I was still seeing the world through a cloud, so somehow the details of those few hours twinkle brighter through that haziness. The Christmas tree, still fragrant, cut from the woods on their last trip out of the city. The warmth and the light with the rain so determined to chill the world outside the windows. And on the counter, a whole row of jars of preserved lemons, on their way to gifting. I picked up a jar. My stomach growled. My mouth watered. “Take one home!” India told me. They weren’t quite ready, but they would be soon. I looked at my bag, already far less classy that what I should have been taking into the offices of Glamour the next day. It was packed, overflowing even, and I was already wondering how I would carry it around me from meeting to meeting. And then I thought about those lemons jostling in my bag, the fermentation building up until some moment when I’m talking to the food editor at O Magazine and the jar explodes in my bag. (Note: I have never had a jar explode! But on principle it’s not such a good idea to bounce a jar of naturally fermenting pickles around too much, and when one is meeting intimidating people, it is good to err on the side of safety.) For a moment, I thought about how that explosion could really up my credibility. That I am, after all, so into making my own foods at home, that I carry them around me, just to monitor the fermentation! But with as much of a sigh as I could let out through my congestion, I left that jar there on her counter. After that, I obsessed about those lemons. They stayed with me until I made my very own jar. And now, even through I’m weeks away, I’m patient and calm. Everyday, I admire my jar of lemons. I turn them over, and I appreciate the thick green of bay against the yellow of the rind. I am doing that winter activity of sitting and waiting until the good things are ready to enjoy. This jar filled with sun and green seems to light up the whole counter. This is preservation for the winter. India uses the recipe from Chez Panisse Fruit, and I’ve mostly used that one here. Some people like to let their lemons process in the fridge, and others let them do their thing on the counter. All that salt and acid make it safe to preserve at room temperature, and then the jar will light up your kitchen, too. Sterilize a 1/2 gallon jar by boiling it for ten minutes or running it through a hot dishwasher. 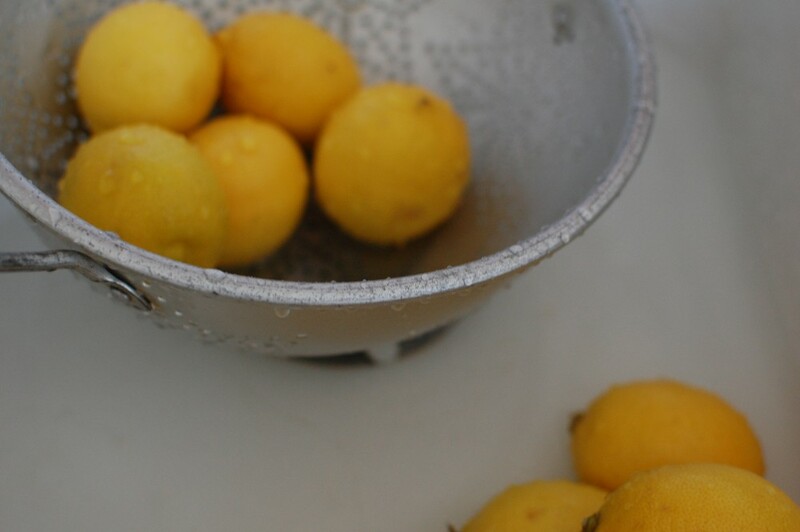 Scrub the lemons to remove any residue (you’ll be eating the peel). Cut off the tip of a lemon. Then cut the lemon lengthwise, leaving the end intact. Cut it again lengthwise at a 90 degree angle to the first cut. The lemons will be quartered, but still attached at one end. Repeat with the other lemons. Rub the flesh of each lemon with salt. Put a few tablespoons of salt in the bottom of the jar. Then push the lemons into the jar, making a layer of lemons. They will release juice and smoosh a bit- this is good. Now add a layer of salt, a few cardamom pods, and a bay leaf. Repeat until the jar is filled. 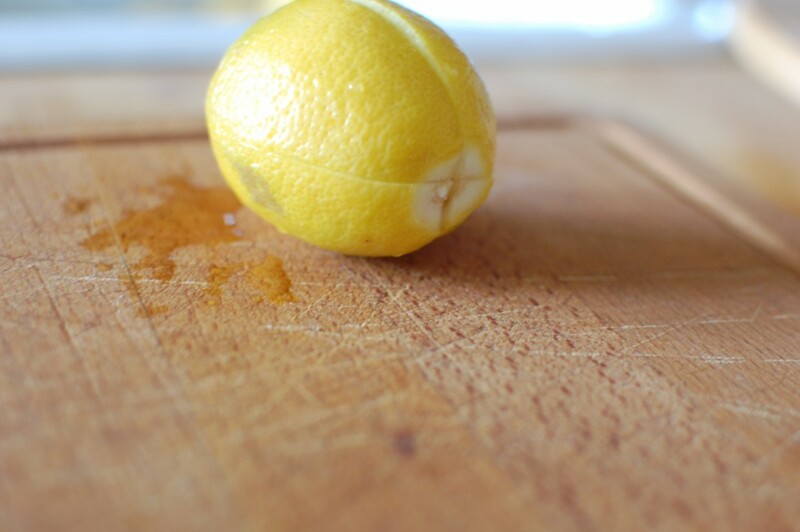 Press the lemons down with a wooden spoon to make them release more juice. Then pour the lemon juice into the jar so that it fills all of the space around the lemons, and so that it covers the lemons entirely. Cover the jar with a sterilized lid, and shake well. I almost danced a jig this morning. You see, I love your blog, your writing and your recipes. But for the last month I’ve been wondering… Now where is she? On vacation? Fed up with writing? Too busy with the holidays? O! Glamour! I’m so impressed with you. And about those lemons — we’ve got some cookin’ right now. What should we do with them when they’re finished? Thank you Anne! (Although at this point, it was just a meeting! I was a little worried they might disapprove of my outfit, but luckily we just talked about homemade crackers.) As for those lemons, here’s a preview of the 3 recipes (my favorite at this point). Just use the rind for this one: cut a baguette in half, and spread a bit of olive oil or butter on the baguette. Roughly chop the rind, spread it over the olive oil or butter. Then sliced halloumi cheese, and put it under the broiler. This is a dish from our local coffee shop for which we regularly dish out far too much money, and it’s pretty fantastic. Other directions? Cocktails! Or pasta. Or… they’re pretty much a necessary in Moroccan food, so you could start working on your tagine…. I went to a Martha Stewart taping in November, and the guest was a Moroccan chef named Mourad Lahlou. His new cookbook was an audience give-away, and there is a recipe for preserved lemons in there. A friend gifted me a jar of preserved lemons, made from the recipe in the book. What a revelation. Everything I cook, I ask myself if I can use preserved lemons in it! and let me tell you I will never look back. They are not the traditional ones, but I think they are a fantastic twist on an already fantastic thing, so if you feel like experimenting I strongly suggest it. I used smoked paprika instead of the cayenne because that is what I have and every time I eat them I get all giddy like a small girl. And it seems like a good time to pack away these ones you posted today because February always needs a little brightening up. Thank you for the inspiration. Beautiful! And I might go with your smoked paprika addition myself. In fact, I might have to get another batch going just so I can have a variety! Love seeing the lemons. I made them last year (from Eugenia Bone’s recipe “Preserved Meyer Lemons in the book “Well Preserved”). I love this book because she puts recipes on how to use the canned goods after they’re made. For the lemons, she lists recipes with seafood that I hoped would be amazing with our local summer catch of crabs and bluefish. Unfortunately, I packed the lemons into jars with wide mouths, and they floated, getting a touch of mold at the top at room temperature. So they sat on the shelf to be admired–still pretty–but not to be eaten. However, I saw the Meyer Lemons are in the store last week, and will try again, undaunted. As a lover of pickles and a lover of lemons, I will succeed. Thanks for the blog post to push me along for another try. Hi! I’ll admit I’m an infrequent visitor and cook, but have somehow got the cooking bug this snow-less January AND my cousin gave me this gorgeous tagine for christmas. I’ve been experimenting with lamb dishes, but wanting to try all the recipes with preserved lemons. And now this. Perfect! I love the addition of cardamom! But I just bought a glorious bag of key limes. Do you think that this recipe would work with those instead? Yes, absolutely! I have never preserved limes myself, but I know that the method is the same. And I’d bet they taste fantastic. I just moved and have finally set up my kitchen (moved in down the street from Hedley – we are friends from Kripalu!) I just made this recipe and I’m a little worried about my lemons! I haven’t done much canning/preserving always being scared of something going wrong and people getting sick, so I have some questions. I didn’t have 1/2 gallon jars so I split it into two 1-qt jars and I didn’t have quite enough to fill the second, so after I shook them some of the lemons floated to the top and are not covered in lemon juice, will they get moldy? Also the one that is full has a few air bubbles in it from shaking, is that okay? Thanks Alana, your blog is awesome, very inspiring! Hi Alison! Lucky you- down the street from Hedley and Zoe! Your lemons are going to be great. Splitting into two quart jars is fine, and yes, your right that the lemons should be covered in brine. But as long as nothing is moldy yet, it’s okay. I’d just make a salty lemon juice solution and cover them right up. Any bubbles are actually a good thing- it means that there is a bit of bacterial activity in the jar, which is what you want. 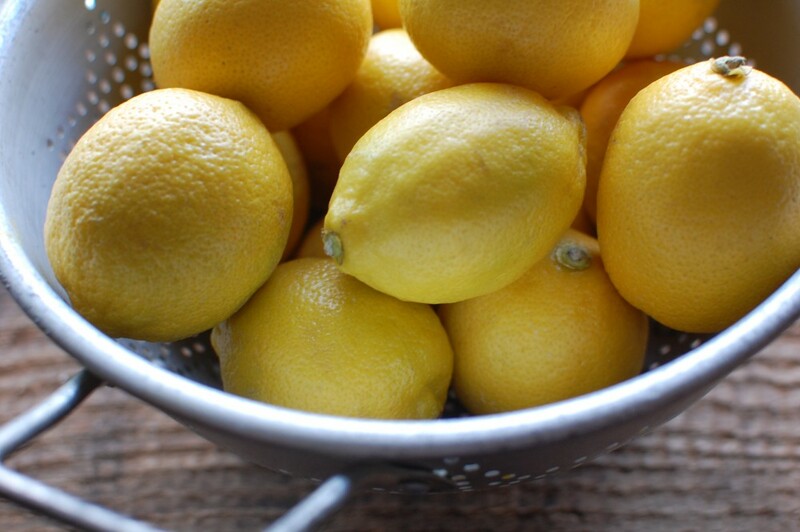 And lastly, if you find that the lemons on the counter are making you anxious, you can absolutely transfer them to the fridge. They will still preserve- it will just take longer at that temperature. Congratulations on your first preservation endeavor! This is a great one to start with. And keep in mind that you’ve got a preservation master down the street. I’m sure that Zoe would help out or take a look at your lemons if you’re feeling unsure of them. Awesome, thanks, can’t wait till they’re done and I can try to recipes (especially the hummus, it sounds amazing). Loved this post and had to share my success! Yippee my lemons are wonderful. Chopped some up tonight and stirred into a combo of mayo and plain yogurt to make a dipping sauce for homemade fish sticks. So yummy – even the flavor of cardamom pokes through. Found a great fix for floating lemons. 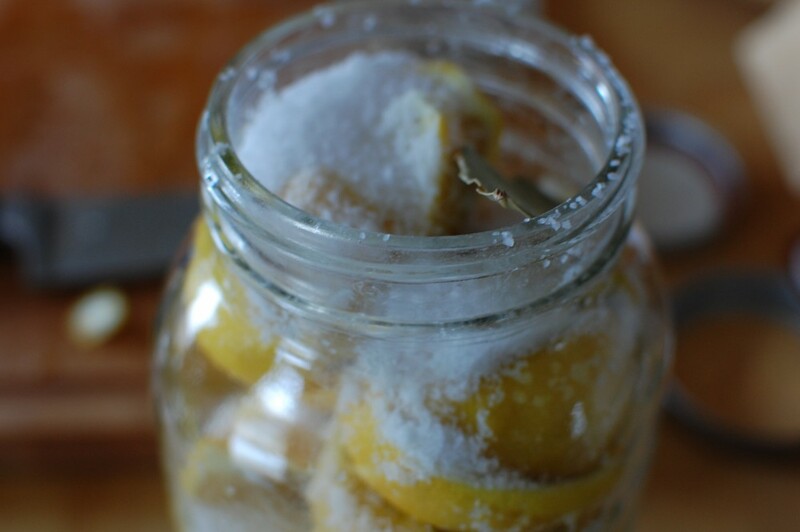 Cut two wooden skewers so that they can sit inside the jar crisscross over top of the lemons. It kept the lemons fully submerged even when I turned the jar and shook it a bit. Thanks – love your blog. Hi! I love your blog, just discovered it a couple weeks ago via dinner-a love story. I really love the preserved lemons because our tree is covered in lemons! So a quick question, I just finished up and when I shake the jar juice spills out the top. I didn’t use a screw top jar (didn’t have one) so I used a jar that has the kind of lid you push down and fasten with the rubber around the lid. so should I change the jar? 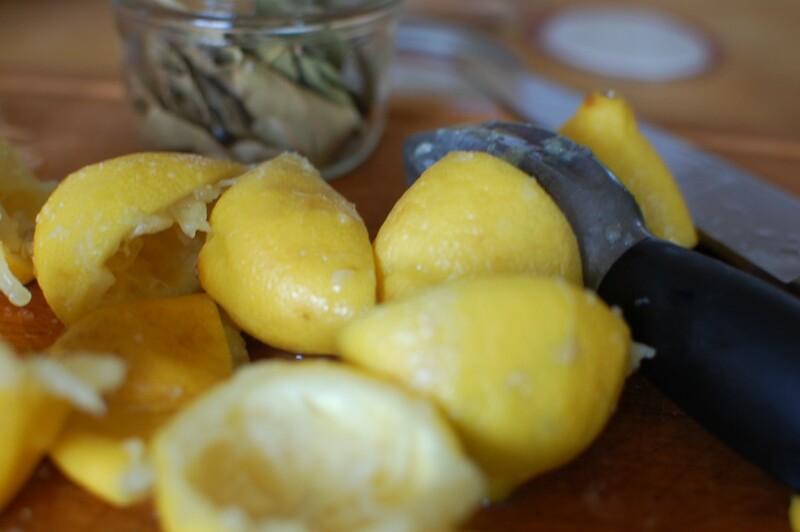 I obviously don’t want to get anyone sick….and I really want some preserved lemons! Hi Jackie! Oh lucky you- a whole tree. I’m really jealous. thanks for getting back to me. I went to the store today and bought a case of mason jars so if this first batch goes well it will be preserved lemons for everyone! It is a running joke with my friends when I see then…”Oh……… you brought me more lemons…………thanks………..” hahah. Don’t know if you saw it recently, but Mark Bittman and Sam Sifton had a great roast chix recipe in the NYT magazine w/ preserved lemons. Separate rind from pulp, slip rinds under breast skin, spread chopped pulp inside and outside the bird, dust w/ cumin, then roast. Halfway through, rub butter and drizzle honey over the bird. Amazing and delicious. I didn’t see it, but it sounds great! I’m working on some chicken/ preserved lemon recipes for Book 2, but cumin never entered the picture. Those lemons are pretty magical though- and with honey! Sounds so good. 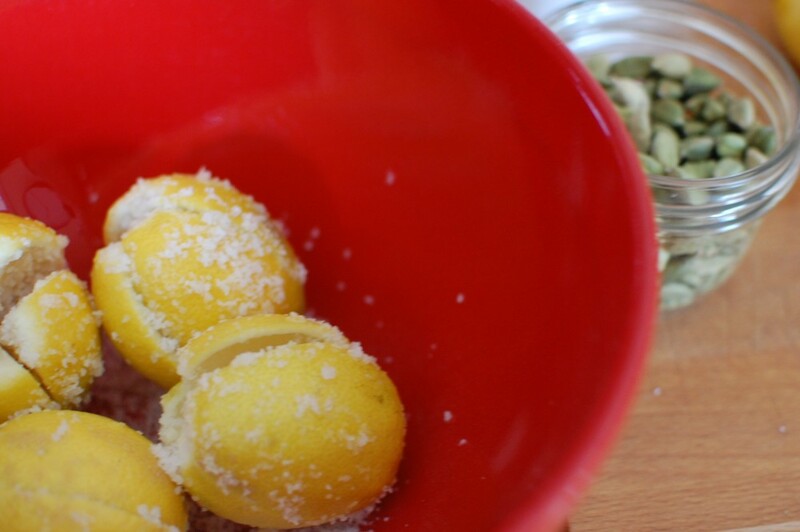 Curious whether you have a use for the juice/salt that is left when the lemons are used up. I know nothin about preserved lemons, but started a small batch for an experiment. Yes, Betty- the juice is great in itself! It’s salty briny-ness makes a fantastic cocktail, but you can also drizzle a bit in salad dressings, hummus- really anywhere where the lemon/ salt flavor would work. can you publish some photos of the finished product.? thanks you for this BTW. Does one need to unscrew the lid of the jar occasionally to release the pressure from the fermentation? A friend of mine exploded several jugs of cider by forgetting to unscrew the lids, just wondering if this recipe would need similar care. I find that lemons don’t build up the pressure like cider does. But you can certainly release the pressure now and then–it won’t do any harm.